Ketchup–not just for French fries! Since I gave up sugar, I’ve had to rethink many innocent looking condiments in my fridge. 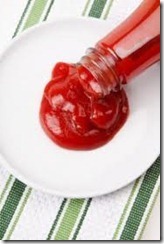 The worst culprit of all – Ketchup, or Catsup. We can’t even agree how to spell this kitchen staple which is loaded with salt and corn syrup even though some dieticians are calling it a vegetable. What a stretch. Whether you have copper-bottomed cooking pans, architectural detailing or shiny knick-knacks, forget mucking about with costly and potentially toxic metal polish pastes. Why not use the ketchup instead. It works quite well if you can get past the messiness. Massage ketchup over the copper and watch it dissolve the tarnish away (thanks to the acid). In the event that you have stubborn spots, add a pinch of table salt while you polish. Some folks have seen decent results getting their cars to shine by rubbing with ketchup. 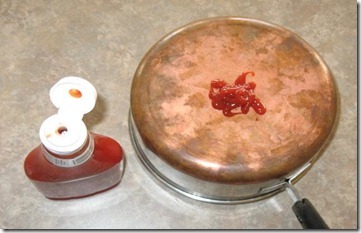 The condiment does a good job cutting tarnish, but not so well in removing dirt. If you’ve lived in a rural or even suburban part of North America, chances are you may have had a run-in with a skunk. Or perhaps your dog has. Although some experts have cautioned that the technique may not work well (beyond a masking sensation), many people still swear by tomato juice as a way to remove potent skunk odor. In the event you don’t have any tomato juice on hand you can try using plain ketchup instead. 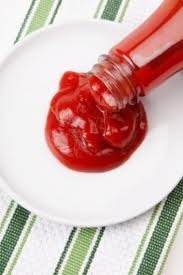 Ketchup can also be used to correct limey-hair-highlights-gone-green, which can sometimes occur from exposure to chlorine found in swimming pools. Smoosh it in, let it linger for about 20 minutes and then wash it out thoroughly. Ugh, that sounds just awful, but I guess it’s preferable to green hair. As any elementary school jokester knows, ketchup makes great (albeit messy) fake blood. This goes for lunchroom antics as well as Halloween parties. Of course, we recommend you exercise a lot of caution with this one, since it’s not much of a win for you or the planet if you have to try to launder away tough stains. Just as ketchup packets can pile up, so can used ketchup bottles, especially in communities that don’t accept them for recycling. If that’s the case in your town, give a thought to some ways to at least get another use out of the containers. including using them for pancake batter storage dispensers. Incidentally, I found that several Ketchup makers are now offerin a reduced sugar varieti3ew that are just as good as the old stand-by and doesn’t leave you with a sugar hangover.